We both love this dish. It is a comforting, happy bowl for the warmer months, stew which usually conjures up thoughts of cold dark evenings doesn’t apply to this one. It is inspired from many trips to Spain and Mallorca. Walking down to the markets and picking up baskets full of different kinds of homemade cured meats, chorizo and sobrasada. If you haven’t come across sobrasada it is like a softer chorizo – a cured sausage from the Balearic islands made from pork, paprika, salt and other spices, some mild and some super spicy. It is very good spread on a bruschetta to serve with drinks, or like in this dish added to the base. If you can’t get your hands on it then just use chorizo sausage instead, and important to get good quality chorizo, check that it is all natural and not full of preservatives and other nasties. This is one of those wonderful, quick and easy one-pot which can easily be made well in advance and will last a good few days in the fridge. This is a good one for feeding numbers, just multiply the ingredient’s for not much extra work. 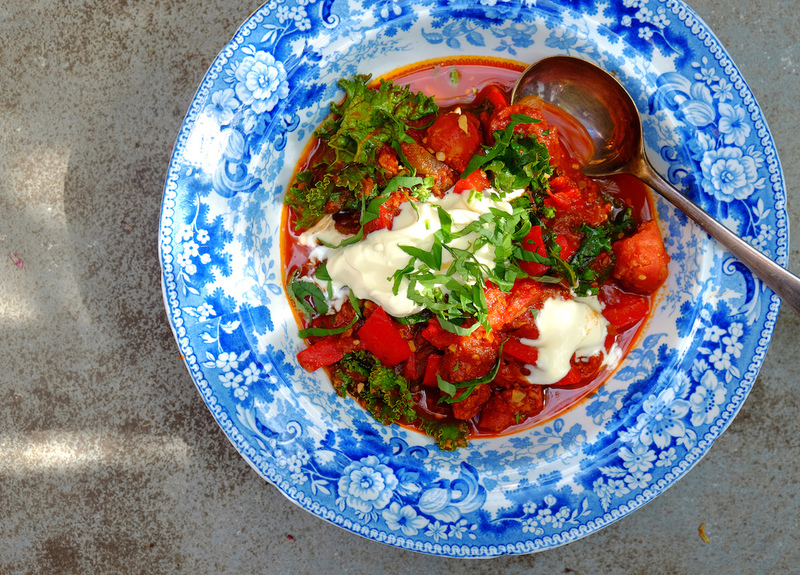 We often serve this dish when we are catering for fashion shoots out on location, when the crew have been up since the crack of dawn and this vibrant, robust number seems to do the trick for satisfying their hungry tummies. Another fun way of serving this, especially if it is for kids is going all Mexican on it, have bowls of sour cream, guacamole, grated cheese, rice, coriander and tortilla chips (we once served this on a shoot for One Direction, happy to say it was a hit). 1. Heat the oven to 200c. place the almonds on a tray and roast for 5 – 10 minutes. 2. Either cut the chorizo into rounds or squeeze out of its skin. Spoon the sobrasada out of its skin. 3. Lightly drizzle olive oil in a pan over a medium to high heat, add the chorizo and sobrasada and cook for 2 minutes till browned. 4. Turn down the heat and add the onion, garlic, celery and thyme, stir to coat in oils and sauté for a few minutes. 5. Deseed the red peppers and chop into small chunks and roughly chop the tomatoes and add to the stew with the paprika. Add the white wine and stock, gently simmer for about 20 minutes. 6. Place the almonds in the food processor and blitz till finely chopped. Add to the stew with the cavalo nero and stir. 7. Taste, season and sprinkle with parsley and basil. Serve with a dollop of sour cream and toasted sourdough. TIP: very good with shredded chicken – added in stage 6. Or with a can of chickpeas to make it hearty, add stage 6.